I thought I would give a final update as to my results for KCWC. As normally happens, my list morphed during the week, and my end results are not quite the same as my to-do list, but in this case I am very happy with the amount of work I was able to accomplish. 6 Appliqued onesies- still need final machine stitching. Whew! That was a crazy week! I will be taking a break from that kind of crazy sewing and will be getting caught up with all my other things piling up. First thing to do is to clean my mess of a sewing room. Then the rest of this week will be spent working on items for the craft fair- only 3 weeks away! Be sure to check out the flickr group to see all the amazing things everyone else produced this week! I will leave you with a picture of Oliver in church nursery yesterday wearing his mama-made clothes as proof that the Charlie tunic now has buttons. 🙂 Oh and can just say how nice it is to have a community who understand the need to make things. I got some comments this weekend about making Oliver’s clothes… “I’ve never met a mom who makes her kid’s clothes” and “how long will you keep making him wear things you make?”. These comments made me feel like I was a bit of a freak for enjoying the art of constructing clothing, and then I remembered Karen’s beautiful post and all the wonderful peeps participating in KCWC and I know that I am not alone! So glad to have a community to back me up! 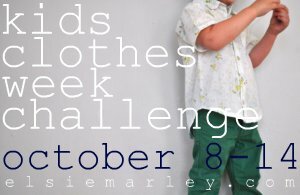 This entry was posted in Kid sewing and tagged charlie tunic, green cords, kcwc by oliver's fancy. Bookmark the permalink. Oh Brooke! You’re the sweetest. You’re not alone, and it’s WORTH IT! Thanks! I am really loving my blogging/sewing community right now… Such a comfort when you get weird comments from people. And your post was quite timely! Thanks! They are my fave product from this week because I have been envisioning them for a while:) ah that mess… Where’s my sewing room fairies when I need them? Are you kidding me? Someone actually said to you “How long will you keep making him wear the things you make! ?” I’m not sure if I would have responded very godly if someone had said that to me! lol Just rest in the fact that your hand made items are ADORABLE and you can make them for him as long as you want! Most of the time people just tell me I’m “ridiculous”. I think they mean it in a good way though… or at least I hope so! My favorite comment someone made to me once was, “oh, you have too much time on your hands.” people don’t understand….we don’t HAVE the time but MAKE the time. It is hard to describe to people who don’t do it I guess!